Whether as a lifestyle choice or for health reasons, eating vegan can be a challenge. Limited menus, eating at restaurants, making and bringing your own dishes to cookouts, arguing that what you eat does actually taste good… you get the idea. Especially during the winter and fall when warm, hearty and meaty dishes are common. Eliminating meat or other animal products doesn’t mean you have to sacrifice flavor or hosting social dinners! 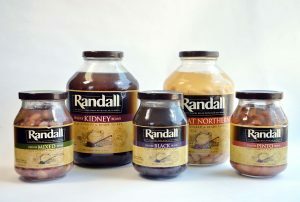 Randall believes that beans unite all diets and lifestyles! 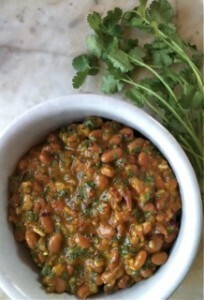 Our recipe developer Rachel has a white bean chili recipe that will make everyone, vegans and meat-eaters alike, happy. Because vegans and non-vegans can definitely agree on one thing – chili rocks! Perfect for cold weather, this recipe puts a twist to our famous traditional white chicken chili! When we made this for a group, two people didn’t even realize it was vegan! Sweet white corn and peppers add great texture and heartiness in the absence of chicken. But, for extra healthiness, protein, flavor and texture, try adding tofu to the recipe! Rich and spicy, yet low on calories, this recipe will agree with your New Year’s resolutions to eat healthier too. This recipe can serve 8 and is ready to eat in under an hour, so call up your friends and get chili night started! Over medium heat, add 2 Tbsp coconut oil to a large pot or Dutch oven. 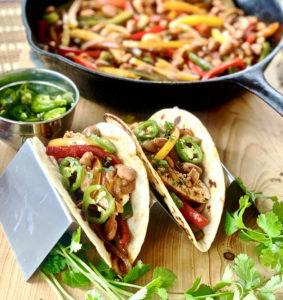 When oil is hot, add diced onions, poblanos, and jalepeño (if desired for heat), stirring until onions are slightly translucent and peppers have softened, about five minutes. Season with coriander, chili powder, and cumin, stirring to coat evenly. Stir in minced garlic untill fragrant, 1-2 minutes. Add the can of diced chiles, verde salsa, and both cans of sweet corn, stirring to combine. Empty entire jar of Randall Great Northern Beans into chili mixture (no need to drain or rinse). Pour in 2 cups of vegetable broth or stock and mix well. Season with salt and pepper to taste and allow chili to come to a simmer for 30-40 minutes. Before serving, remove two cups of equal solid and liquid and carefully pour into blender. Pulse until smooth. Return to pot and stir to mix. This will add more body and texture to the soup. 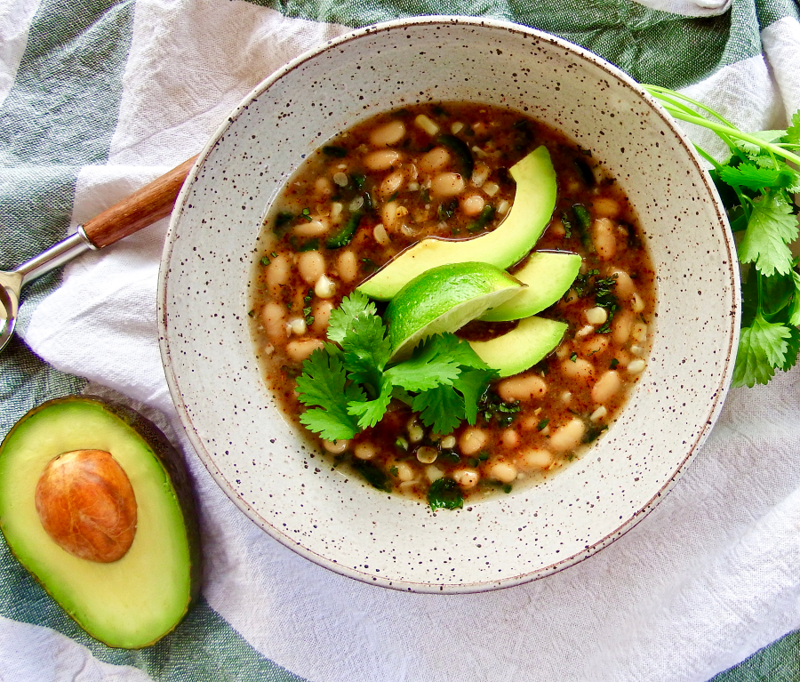 Ladle chili into bowls and top with diced avocado and tortilla strips, garnishing with cilantro. Squeeze lime wedge over toppings and enjoy! Can’t get enough chili? Neither can we! 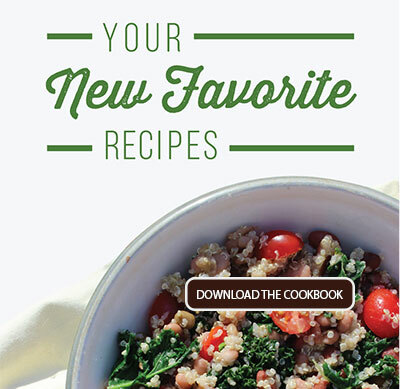 Grab your copy of our FREE cookbook, The Ultimate Guide to Chili. There are enough amazing chili recipes – from traditional recipes to unique takes on classics – that you’ll be able to make a new pot of chili every week all winter long and never get bored! Follow the link below.